Rancho Baaxal was created for people who are looking for more than typical tourist attractions with hordes of people and where treated as money-machines. We want to show our guests our non-commercial piece of paradise and treat them the way we like to be treated ourselves - more like friends than customers. We are a small ranch with only 12 horses and we are not planning on growing - we want to continue giving our visitors a unique and personalized experience, a few guests at a time. 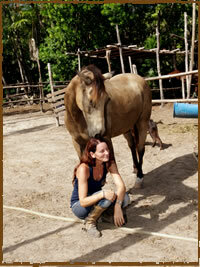 Horses are a passion to Swedish ranch owner, Lisa. The ranch is run as a non-profit operation and any and all profits are reinvested in the horses. Lisa was looking for a new home for her horse Nay when she came across this small rustic ranch in the paradise of Maroma Beach. A few months later in early 2008, Lisa was offered to take over the ranch, and some of the horses that were already there, and opened it to the public. Lisa saw her chance to fulfill a dream of giving unhappy and neglected horses a second chance in life, so the family soon grew larger when she offered a better home to several other horses. Then Rancho Baaxal was born.